In 1982 Imagic programmer Rob Fulop wrote a game based on a 2-player variant of the popular Rubik's Cube puzzle, called Rubik's Race. 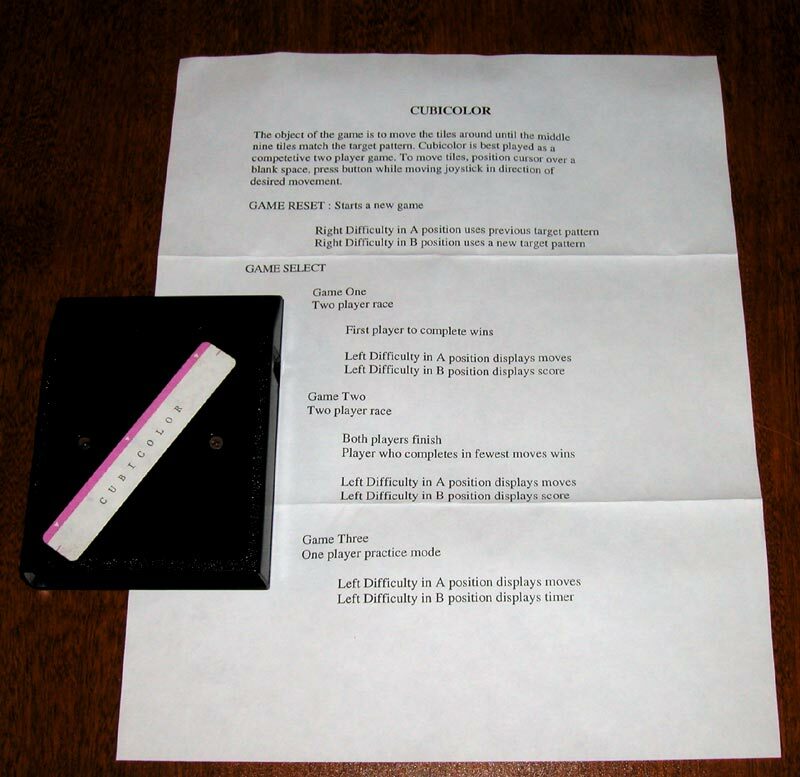 His game, Cubicolor, wasn't approved by Imagic while he was in their employ and years later he set off to make the game available to others that he thought might appreciate the work. In 1993, Fulop offered copies for sale via the "2600 Connection" newsletter, at $100 each. here is the straight scoop ... I did Cubicolor in 1982 after Cosmic Ark and before Fathom because I went to visit relatives in Hungary, and met Rubik himself, the Rubik's cube guy, , and on the flight home convinced myself that two player games were under-represented and we can't all play "Death From Above" forever, so why not "mix it up" instead of doing a sequel to Demon Attack which is what Imagic wanted me to do. "Death from Above" was my standard name for any game featuring the play pattern of menacing looking incoming flying things that are trying to kill you for no apparent reason other than you exist. Kill as many of them as you can before you inevitably perish, hit reset, play again. Space Invaders was the first, then Galaxians, then Phoenix, then Centipede ... all the same play pattern known fondly as "Death From Above". Cubicolor was programmed in six weeks and fit comfortably in 2K of ROM. To this day, nobody has ever beaten me in a game. Thankfully, Bruce Davis, the attorney at Imagic at the time played politics skillfully and convinced the company to not bother releasing a puzzle game in a market dominated by Death From Above over and over again.. He was right, of course. Cubicolor demoed terribly, puzzle games were slow sellers and there was nothing to destroy or kill. So I kept a box of ROMS and dragged them around for years and then one day some guy calls me from the VideoGame Update or something and interviews me and begins drooling upon learning I had a bunch of these sitting around, and he convinces me to sell them through his newsletter. So I thought "why not" and I think I asked fifty bucks a piece and had the clever idea of numbering them as sort of a " limited edition", and I don't remember how many I sold but it wasn't a whole helluva lot, and I sort of forgot about Cubicolor for a few years. Fast forward a few years and I got a letter from somebody asking about Cubicolor and he told me he had just bought one for a hundred bucks, and how do you play the damn thing anyway, and I figured why not run another ad and sell the rest, and that's all I really remember, except I sold them fast for a hundred bucks and recall thinking to myself "Just you wait Bruce Davis, just you wait". Now about the duplicate #7 ROMS, my guess is I forgot the count from when I first sold them, to when I second sold them .... I mean like I wasn't trying to pull a fast one or anything .... OK, if you want a refund I'll be happy to buy any or all Cubicolors back for the price you paid me for it plus I'll even throw in a copy of DOGZ II and a PFMAGIC tee-shirt ... just tell me your size. But after yesterday when I saw that somebodly paid like almost a grand for one of these, I went scrambling through my office and found a few more that I'll probably hang onto so at lleast I'll know I can always buy dinner at the Sizzler in a few years by selling it off. You can't beat the cheese toast at the Sizzler, like I love the way it's all crunchy and cheezy on top and sort of mushy and warm on the bottom. I hope that answers the Mystery of Cubicolor once and for all. "List of Cubicolor Names: Greg Hillegas, Jerry Albanese, Kenny Brooks Jr., Sam Twiford III, Jeff Cooper, Richard Klein, Norman Langberg, Tom Howe, Scott Vanarsdall, Craig Pell, Edward Villalpando, Mervil Carmickle, Al Backiel, Mark Androvich, Rich Klien, Michael Marcy, Jerry Greiner, Kevin Oliz, Tony Bueno, Bill Zandrew, Tom Holzer, John Earney, Dave Cadieux, Matthew Archambeau, Richard Wilkins, Desmond Rohbeck, Joe Alfred Izen, Marvin Lopez, Scott Williams, Louis Percarpio, Don Rogers, Scott Stilphen, Gregg Woodcock, Dan Skelton, Delf Meek, and Robert Burtt. Many of these people requested multiple carts. There were originally 50. There are no more left and Rob has no plans to make anymore at this time. P.S. I don't even have a Russ Perry Jr. on my list!" Here is our latest documented list of the owners. If you own one of these numbered cartridges and it's not listed, please get in touch with us or Tim Duarte (timdu@hotmail.com)! As far as we know, although the specifics of what kind of home-made label is (or isn't) on them, every genuine Cubicolor cart contains an actual ROM chip, not an EPROM. Jim Redd/Pleasant Valley Video (who resurfaced on Ebay around 2004-05 under the ID "possum-glory") sold several fake copies back in the early 90s (Tim Duarte bought one for $18 and the cart was in a Mystique shell), so beware! We do not need your contact info if you don't care to give it out. Also if you can prove differently than what you see here, by all means let us in on it! Michael "riffraff" Garber 06* *6 of 60 - bought it from Devin Knight in May 1996 for $200. The paperwork might be a photocopy. James "DeusExMachina" Manazer 11 James Manazer bought it from Rebecca Heineman, who bought it from James in 1997 for $1,500. James originally bought it from from Ben "le geek" Langberg via RGVC in 1995 for $222.22. According to Langberg, "My Dad (Norman Langberg) purchased #11 for me, for $100 (likely via the 2600 Connection). Mark Androvich 12 12 of 50 (PIC) "I accidentally knocked the small sticker off the top of Cubicolor cartridge that I bought from Rob Fulop several years ago (12 of 50). The sticker/label said Cubicolor in typewritten letters, but when I knocked it off, I found another sticker underneath. This one said 'Balloon Race'." James "DeusExMachina" Manazer 24 (PIC) Bought it on eBay from Tony Bueno on March 21, 2007 (for $1692.38). Bill Combs 25* *20 of 60. Bought from John Breeding. Dated June 4, 1994. Jose "wonder007" Artiles 30 Bought it from Adam "buyatari" Harvey, who bought it at CGE2K1 from Rob Fulop. The strip is signed by Rob, has 30/50 circled, and is dated 8/10/01. Artiles did not get any documentation with it. John G. Earney 48 Also states his cart has a double label, and that the bottom label says 'Balloon Race'.
? 49 Jerry Greiner sold this years ago, when he was still running Atari2600.com, but doesn't remember who he sold it to. Al Backiel 60 Purchased from 2600 Connection. Ian Baronofsky "I have an unnumbered Cubicolor cart. I bought it through the newsgroup about 5 years back from a guy who got it from Rob, who promised it to him when he came through his company for a job interview." 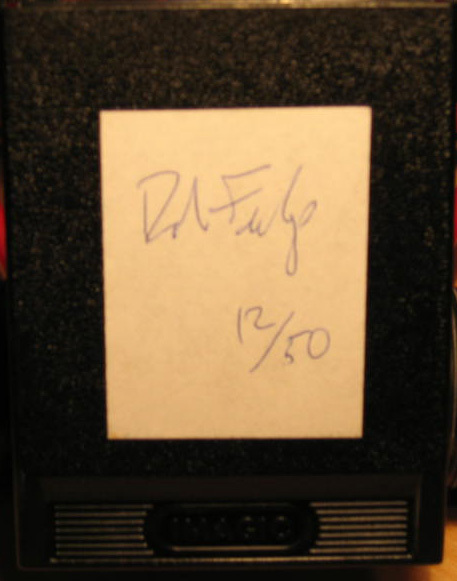 Dean Dierschow Owns a Cubicolor cartridge that is unnumbered, with Rob's signature and "4/20/92". 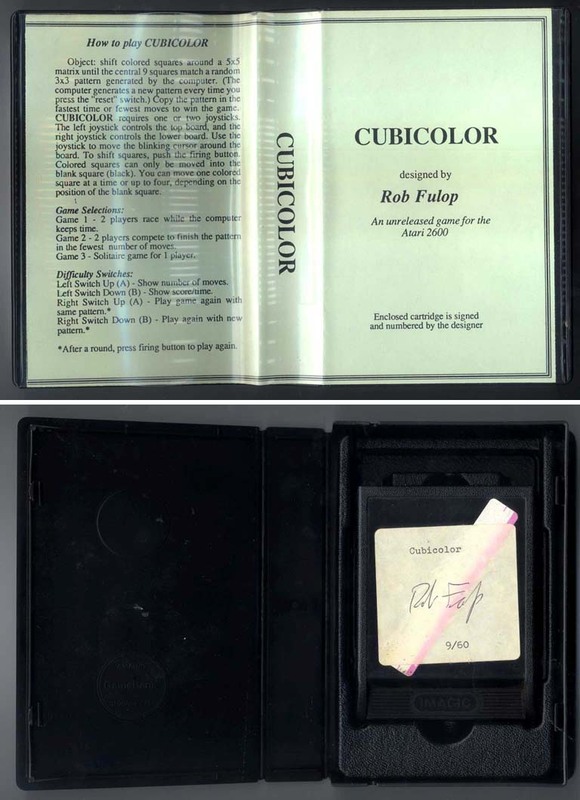 Marc Oberhaeuser Bought Jeff Cooper's entire collection in 1997, which included a Cubicolor cartridge with no #. 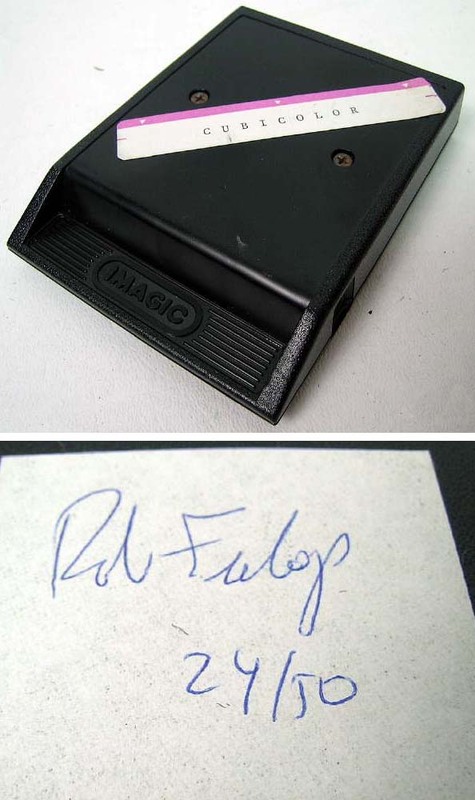 It just says: "Rob Fulop 11/10/93".
? Robb Alvey got an unnumbered cart from Rob Fulop on a visit to P.F. Magic (Rob gave him the cart). He later sold it on Ebay in 2000, but doesn't recall who purchased it. Jose Artiles (PICS) Bought it from Troy "allhallowseve2000" Saling. Troy listed it on Ebay in 9/2010 for $5k (but it didn't sell). He got it from James "DeusExMachina" Manazer in a trade in 2010. Manazer bought it in 12-08 from Joe Siegler (the webmaster for 3D Realms). About 7 years earlier, Siegler "ran into Rob Fulop online as part of my duties. We got to chatting about videogames, and Rob ended up sending a copy of Cubicolor. Didn't pay for it, he just nicely sent it for free. Rob said when he sent it to me that 'it was my last copy'. I don't believe this was part of the 'group of 50' - it had to be somewhere else." Manazer stated it's not numbered and includes a letter. I worked for Rob for six years (see my prior post, "Why I'm selling my cubicolor"). I was the one who sent out the second wave of cubicolors to people who answered the 2600 connections ad. I actually had to put some of the original roms together with the imagic cases. I *believe* Rob has cubicolor #1-3. He also had 4 more roms that weren't placed into an imagic case. I took one of those roms and placed it into a cracked imagic case. Rob wouldn't sell that damaged one, so he let me keep that one. He also gave me cubicolor #31 for my troubles in helping him sell/mail away his carts. So to my knowledge he only has 3 more roms left. For a total of 6 copies (3 roms, 3 carts) left unreleased to the public. I know Rob very well and doubt he'd sell those last 6. Unless he needed the money, which he doesn't now (he recently sold PF. Magic to The Learning Company, and is a millionaire again....) I don't think he'd do it. Then again, if he blows his millions like he did in the days after Imagic, he could very well sell those last 6 for Sizzler's world famous cheesy-toast he loves so much. "DreamTR" (from Atariage) bought a cart from Video Take Out in either 1986 or '87. "Trade-N-Games" bought a cart in 2006 for $1,000. CGE 2003 - cart sold (auctioned?) for $550. 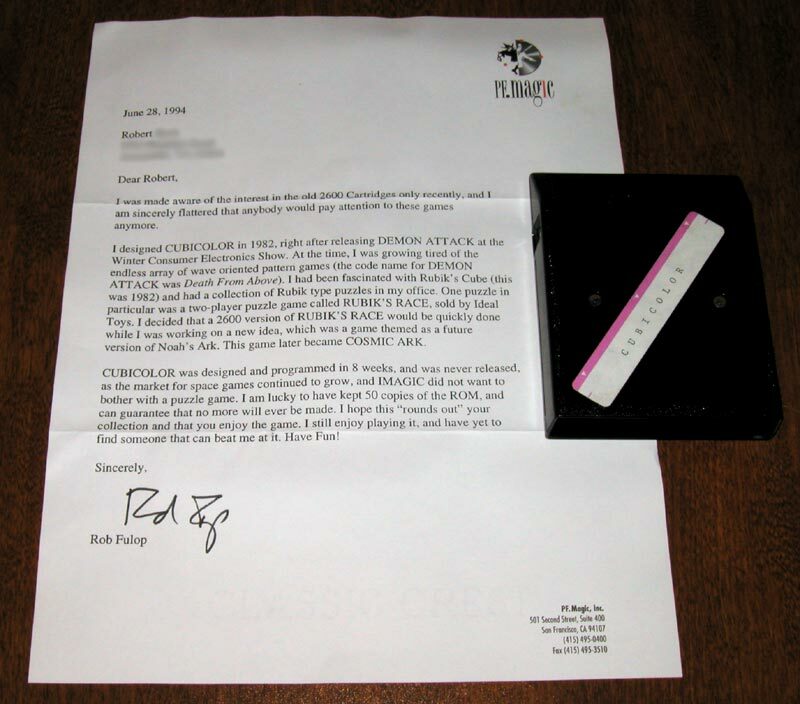 Paul Papierman - owns a Cubicolor cartridge that we believe to be one of the original 50 cartridges produced in the 1980s. It has a production ROM dated 1982 and is not an EPROM or a "hacked" board. 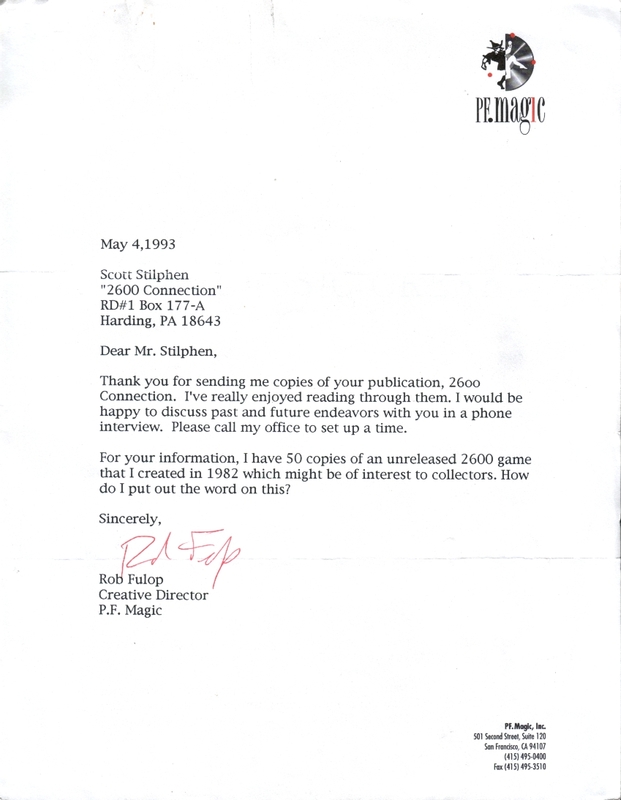 Scott Stilphen was promised a copy by Rob Fulop in return for helping him sell his carts back in 1993 (via the 2600 Connection n/l) but Rob never sent it.